Ghana international Solomon Asante opened his Phoenix FC account in a hard-earned victory over MLS side New York Red Bulls in the Mobile Mini Sun Cup. The former Berekum Chelsea and TP Mazembe attacking midfielder slotted home from a blistering counter-attack before a second-half spot-kick from Didier Drogba completed the scoring for Phoenix. Solomon Asante, who ended his hugely successful tenure with TP Mazembe, joined Phoenix in the winter transfer window. The pocket-size, however, showed signs of his monstrous form with some quick feet for his new paymasters, capping an impressive outing with a beautifully taken goal as well. A lightning counter-attack from Deogou Mala freed Billy Forbes on the left flank, whose textbook passes landed kindly for Solomon Asante. The Ghanaian import kept his composure and opened the scoring in the 28th minute to put Phoenix 1-0 up. 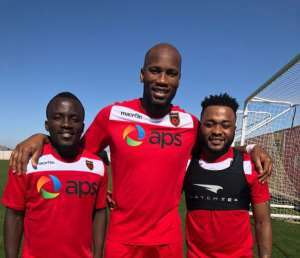 The impressive Asante later played a crucial role en route to the second goal as Didier Drogba converted the resultant spot kick to put Phoenix 2-0 just 10 minutes into the second department of the game.